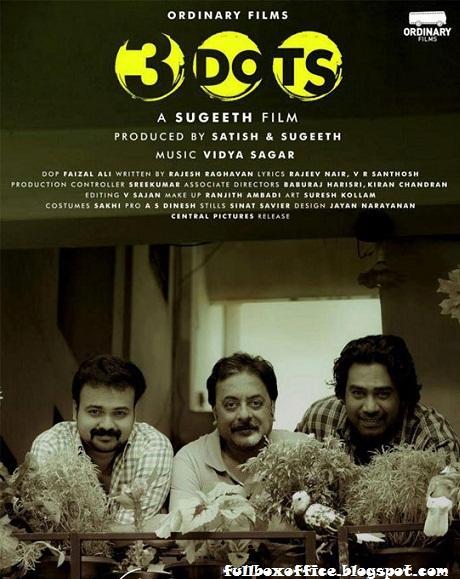 3 Dots is an upcoming Malayalam-language film directed by Sugeeth. Kunchacko Boban in the lead role with Biju Menon, Prathap K. Pothan and Narain play supporting roles. Tamil heroine Janani Iyer will play the female lead. 3 Dots is being produced by B. Satish and Sugeeth under the banner of Ordinary Films, and will reach the cinemas in March. Abandonment is more a ‘full stop’ in life to many. 3 dots represent three, so said, abandoned lives, Louie, Pappan and Vishnu, who find the meaning of life through companionship. These 3 dots, in principle, represent three tenses, Past, Present, and the future. Going through episodes of humorous and thrilling events, with many twists and turns, and a suspense filled climax, this multi-starrer comedy-thriller unfolds the importance of family values and togetherness. '3Dots'-The story line goes by the lives of three criminals who meet in jail and become friends and events that happen in their jail lives. Prathap Pothen and Rahman are also playing the roles of lead characters in the film.